Last week, after I published my holiday baking ebook, we went on vacation to Malta. It was an amazing trip and most of all it was warm and sunny. (A blog post about that is coming up later this week, I promise!) I forgot my phone, and that meant although I had access to the internet, I didn’t have access to my email account passwords, etc. When we returned I was completely overwhelemd by all the positive feedback for my ebook. Thank you everyone who downloaded it, left a comment or wrote me an email! I really appreciate all your feedback. You guys are the best! I hope you will enjoy the recipes. When I translated the zine into German yesterday, I realised there were some unclear instructions in two or three of the recipes. I am pretty sure you’ll figure it out anyway, but I uploaded a corrected version, too. Now we are back in Germany and as soon as I saw they grey skies outside, I was back in baking mood! In Germany is one of the most traditional baking items during holiday season. It’s a cake made from a very rich yeast dough and it’s stuffed with raisins, succade, and nuts. Usually it is made from one part fat (traditionally butter is used, some recipes also contain lard) and two parts flour and as little liquid as possible. It has a very dense texture but it also keeps for weeks, sometimes even months if stored properly. That’s because of the high fat content and the habit to brush it with tons of butter after baking. I made a whole loaf of stollen last year. (I made it with cranberries and it’s basically the same recipe used for the stollen bites.) 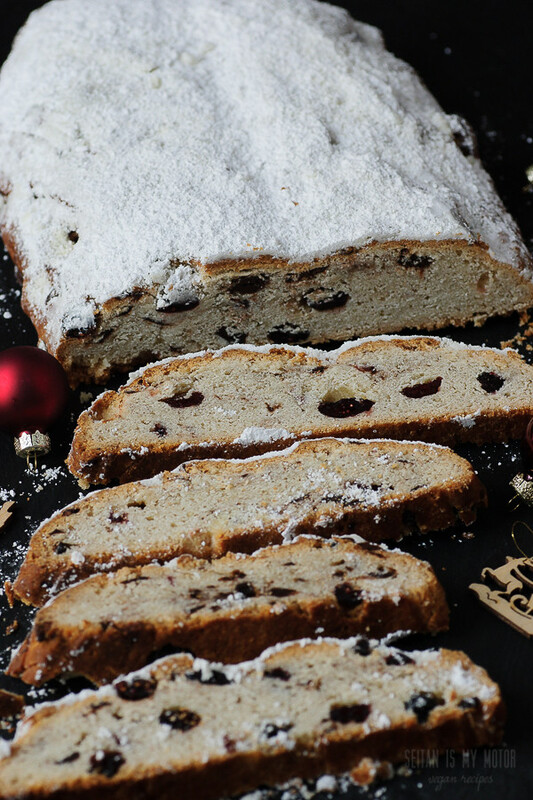 But even though it keeps well, we tend to get tired of eating stollen after a couple of days. A whole loaf is great if you have a bigger family to feed! So I came up with single serving mini stollen. They can be eaten fresh and still warm, but if you want to experience the traditional texture, you should wrap them in plastic foil and let them sit for 2-3 days. My grandmother used to make stollen every year. She used rum to soak the raisins in and lots of succade. 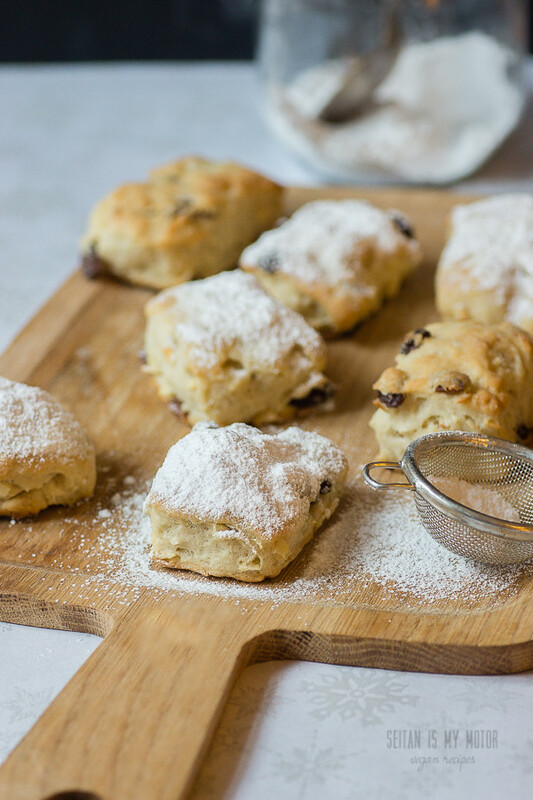 I think both flavours are essential to a stollen, that’s how our stollen always tasted. But when I was a kid I also picked out all of the succade pieces before eating my slice of stollen. And I still do that. It is too bitter for me. Since P and F also don’t seem to like it, I tried to preserve the flavour it adds without actually using succade. I used lemon flavoured olive oil and it worked out quite well. If you like succade and have acces to it, you can use regular canola oil instead of the lemon flavoured oil and replace one or two tablespoons of raisins with succade or chopped, candied lemon peel. Mix flour, sugar, and yeast in a bowl. Add soy milk, salt, vanilla, oils, and sliced almonds. Knead well. The dough will be form but greasy. Cover and let rest in a warm place for 1 – 1 1/2 hours. The dough won’t rise much. Combine raisins and rum and let sit while the dough is resting. Drain the raisins and knead into the dough. Place on a floured working surface. Roll into a square, about 1 inch thick. I used a rectangular cookie cutter (7 x 4.5 cm or 2.8 x 1.8 inch) to cut the dough into 11 equally sized pieces, but you can use a knife, too. Cut into 10 pieces of the size mentioned before and use the remaining dough to shape into a 11th piece. Place on a baking sheet lined with parchment paper and cover with a kitchen towel. Let rise for 30 minutes. Meanwhile preheat the oven to 160°C (320°F). Bake for 20 minutes or until golden brown. Remove from the oven and immediately brush with melted oil or margarine and dust with powdered sugar. Serve once cooled or wrap in plastic and store in a cool place. I’ve made these a few times more, and they always disappear so fast! These are so delicious, like all of your recipes, and they get me to work on my skills as a baker! Thanks! I haven’t downloaded yet but I will soon!